We ask our volunteers to commit 3-5 hrs a week for a minimum of 1 year. This allows our facilitators to develop relationships with the support circle participants within the context of the circle. The trainers were very informed with an obvious wealth of experience coupled with a solid academic background that support the activities. I was taught how to be a facilitator not a caregiver. This workshop was inspirational, timely, to the point, energetic, friendly. This training helped move my one-on-one counselling skills into a group environment. 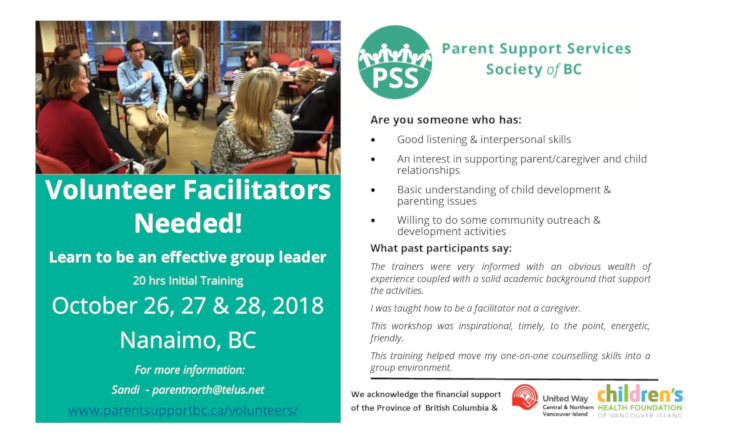 We have several openings for volunteers for Parenting Support Circles in communities such as: Duncan, Nanaimo, and Parksville.